Two important safety cautions: First: Never, ever place a Bumbo seat—or any other baby device such as a bouncer seat—onto an elevated surface, such as a sofa, bed, table, or countertop. Even a small baby could get the chair off-balance and topple onto the floor, with serious consequences. Second: Always use the safety retraint belt. You can buy Bumbo seats online and in stores for around $40. 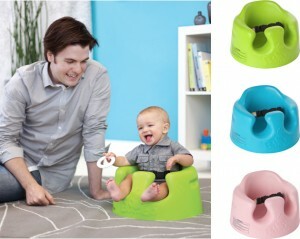 Visit Bumbo.com for more information.